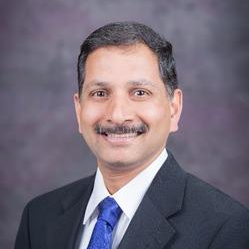 Dr. Prasad’s research interests primarily include: understanding crop responses to environmental factors (water, temperature, nutrients, and climate change factors) and to changes in genetics and crop management practices; and developing best management practices for efficient use of resources. His teaching interests include graduate level courses in crop physiology and in crop ecology. He provides leadership in interdisciplinary research, knowledge sharing, and capacity building activities on sustainable intensification for improving food and nutritional security of farmers. He has active research and capacity building program in Asia and Africa. His role in the Ogallala Water CAP will be to work with crop modelers, agricultural engineers and agronomists to develop crop management practices that will increase resource use efficiency, productivity, profitability, resilience and sustainability of cropping systems, that will lead to improved livelihoods of people. The ultimate and longer-term success of the Ogallala Water Coordinated Agriculture project will be based on the adoption of crop practices by the producers that will show measurable impacts on production, resources, and livelihoods of people. Dr. Prasad notes: "The greatest opportunity we have in this project is to provide scientific evidence that we can simultaneous improve crop production and protect environment using principles of sustainable intensification." Mahama GY, Prasad PVV, Roozeboom KL, Nippert JB, Rice CW. 2016. Response of maize to cover crops, fertilizer, nitrogen rates, and economic return. Agronomy Journal 108: 17-36. 17. Mahama GY, Prasad PVV, Roozeboom KL, Nippert JB, Rice CW. 2016. Cover crops, fertilizer, nitrogen rates, and economic return of grain sorghum. Agronomy Journal 108: 1-16. Ciampitti I, Prasad PVV. 2016. Grain nitrogen source changes in sorghum: a review. Frontiers in Plant Science 7: 272 (doi: 10.3389/fpls.2016.00275). Narayanan S, Prasad PVV, Fritz AK, Boyle DL, Gill BS. 2015. Impact of high nighttime and high daytime temperature stress on winter wheat. Journal of Agronomy and Crop Science 201: 206-218. 28. Riar MK, Sinclair TR, Prasad PVV. 2015. Persistence of limited-transpiration-rate trait in sorghum at high temperature. Environmental and Experimental Botany 115: 58-62. 29. Prasad PVV, Djanaguiraman M, Perumal R, Ciampitti IA. 2015. Impact of high temperature stress on floret fertility and individual grain weight of grain sorghum: sensitive stages and thresholds for temperature and duration. Frontiers in Plant Science 6: 820 (doi: 10.3389/fpls.2015.00820). Pradhan GP, Prasad PVV. 2015. Evaluation of wheat chromosome translocation lines for high temperature stress tolerance at grain filling stage. PLoS One 10(2): e0116620. 30. Prasad PVV, Djanaguiraman M. 2014. Response of floret fertility and individual grain weight of wheat to high temperature stress: sensitive stages and thresholds for temperature and duration. Functional Plant Biology 41: 1261-1269. Mahama GY, Prasad PVV, Mengel DB, Tesso TT. 2014. Influence of nitrogen fertilizer on growth and yield of sorghum hybrids and inbred lines. Agronomy Journal 106: 1623-1630. Narayanan S, Prasad PVV. 2014. Characterization of a spring wheat association mapping panel for root traits. Agronomy Journal 106: 1593-1604. Paul G, Gowda PH, Prasad PVV, Howell TA, Staggenborg SA, Neale CMU. 2013. Lysimetric evaluation of SEBAL using high resolution airborne imagery from BEAREX08. Advances in Water Resources 59: 157-168. McMaster GS, Ascough II JC, Edmunds DA, Neilsen DC, Prasad PVV. 2013. Simulating crop phenological responses to water stress using the phenology MMS software program. Applied Engineering in Agriculture 29: 233-249. Narayanan S, Aiken RA, Xin Z, Prasad PVV, Yu J. 2013. Water use efficiencies in sorghum. Agronomy Journal 105: 649-656. 54. Selected publications (15 from last four years): Mahama GY, Prasad PVV, Roozeboom KL, Nippert JB, Rice CW. 2016. Response of maize to cover crops, fertilizer, nitrogen rates, and economic return. Agronomy Journal 108: 17-36. 17. Mahama GY, Prasad PVV, Roozeboom KL, Nippert JB, Rice CW. 2016. Cover crops, fertilizer, nitrogen rates, and economic return of grain sorghum. Agronomy Journal 108: 1-16. Ciampitti I, Prasad PVV. 2016. Grain nitrogen source changes in sorghum: a review. Frontiers in Plant Science 7: 272 (doi: 10.3389/fpls.2016.00275). Narayanan S, Prasad PVV, Fritz AK, Boyle DL, Gill BS. 2015. Impact of high nighttime and high daytime temperature stress on winter wheat. Journal of Agronomy and Crop Science 201: 206-218. 28. Riar MK, Sinclair TR, Prasad PVV. 2015. Persistence of limited-transpiration-rate trait in sorghum at high temperature. Environmental and Experimental Botany 115: 58-62. 29. Prasad PVV, Djanaguiraman M, Perumal R, Ciampitti IA. 2015. Impact of high temperature stress on floret fertility and individual grain weight of grain sorghum: sensitive stages and thresholds for temperature and duration. Frontiers in Plant Science 6: 820 (doi: 10.3389/fpls.2015.00820). Pradhan GP, Prasad PVV. 2015. Evaluation of wheat chromosome translocation lines for high temperature stress tolerance at grain filling stage. PLoS One 10(2): e0116620. 30. Singh RP, Prasad PVV, Reddy KR. 2015. Climate change: implications for stakeholders in genetic resources and seed sector. Advances in Agronomy 129: 117-180. 31 Prasad PVV, Djanaguiraman M. 2014. Response of floret fertility and individual grain weight of wheat to high temperature stress: sensitive stages and thresholds for temperature and duration. Functional Plant Biology 41: 1261-1269.Mahama GY, Prasad PVV, Mengel DB, Tesso TT. 2014. Influence of nitrogen fertilizer on growth and yield of sorghum hybrids and inbred lines. Agronomy Journal 106: 1623-1630. Narayanan S, Prasad PVV. 2014. Characterization of a spring wheat association mapping panel for root traits. Agronomy Journal 106: 1593-1604. Paul G, Gowda PH, Prasad PVV, Howell TA, Staggenborg SA, Neale CMU. 2013. Lysimetric evaluation of SEBAL using high resolution airborne imagery from BEAREX08. Advances in Water Resources 59: 157-168. McMaster GS, Ascough II JC, Edmunds DA, Neilsen DC, Prasad PVV. 2013. Simulating crop phenological responses to water stress using the phenology MMS software program. Applied Engineering in Agriculture 29: 233-249. Narayanan S, Aiken RA, Xin Z, Prasad PVV, Yu J. 2013. Water use efficiencies in sorghum. Agronomy Journal 105: 649-656. 54. Craufurd PQ, Vadez V, Jagadish SVK, Prasad PVV, Zaman-Allah M. 2013. Crop science experiments designed to inform crop modeling. Agricultural and Forest Meteorology170: 8-18.